Hidden in the laneways of Darlington, A Little On The Side is a local gem. It’s attached to a Medina hotel of all things, and caters for hotel guests and locals. The interior is small with just handful of tables and space for one more on the balcony. Luckily there is also a courtyard to the rear where pets are allowed. We found the staff to be very friendly and chatty. Drinks were offered and chilled water was delivered shortly after we were seated. We apologise beforehand – the yellow tinge in the photos below was due to the light cast from the shade covering the courtyard. The coffee served here is fantastic. 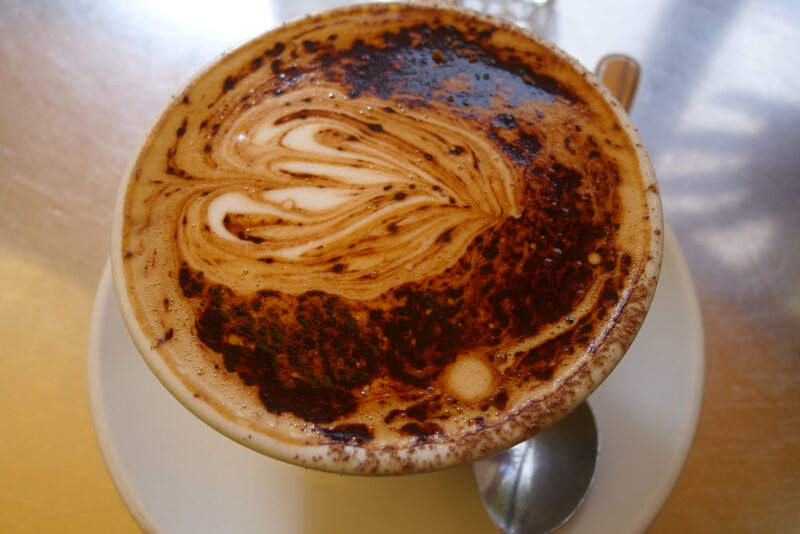 The skim cappuccino ($3) had a good flavour and was served quickly and hot. It was nice to find an alternative to the standard tea and coffee items on the menu. 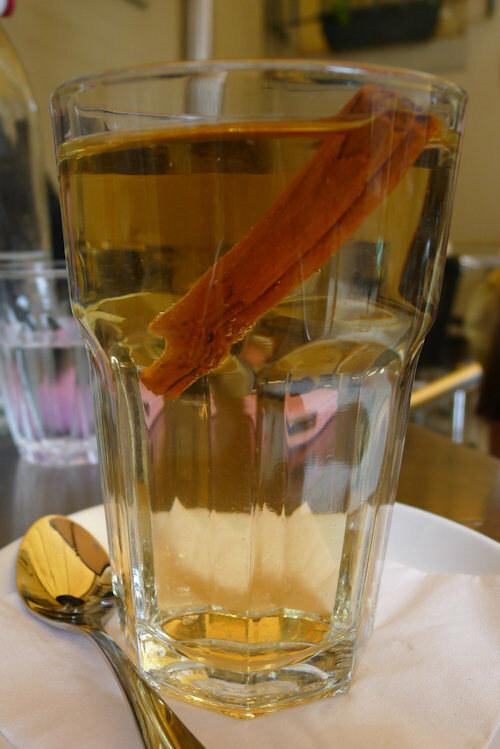 The Turkish apple T2 tea ($3) was warm, fragrant and came served with a stick of cinnamon inside. We left it to infuse and the flavour became stronger and more delicious. Other interesting items offered include the fruity mardi gras, chamomile and monk pear tea. 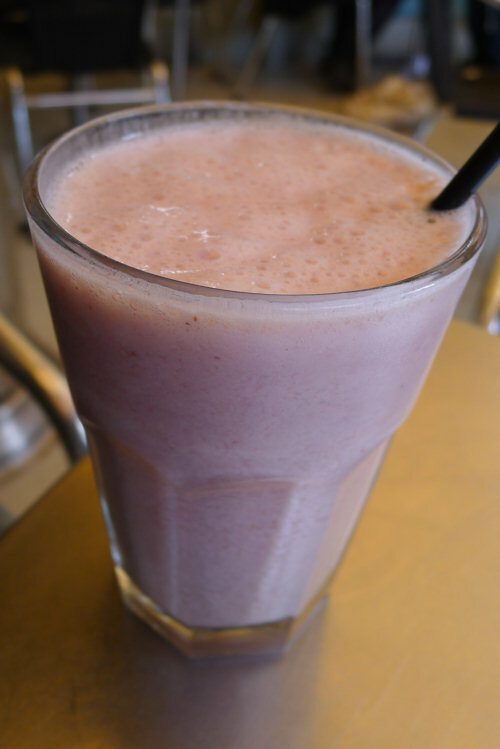 We were expecting more flavour from the banana and strawberry smoothie ($6.50). There was only a hint of banana and very few pieces of real strawberry floating around. Other smoothies on offer include mango & lime and mixed berry & mint. Milkshakes are also available: banana, chocolate & maple, strawberry & vanilla and the intriguing brownie (yes they blend a brownie into the shake!). We’ll be back to try some of these combinations. The roasted garlic field mushrooms ($13.50) was a hit and we all dived in for a taste. They pack a lot onto your plate and it almost overflowed with the side order of bacon ($3). The mushrooms themselves boast a tremendous garlic fragrance and they are topped with a rocket walnut pesto that sends the flavour off the charts. The chilli jam on the side isn’t necessary as there are already enough flavours but it was shared amongst others who had it with their eggs and some toast. The sourdough is quite a mission to cut through but not nearly as tough as some of the places we have been. 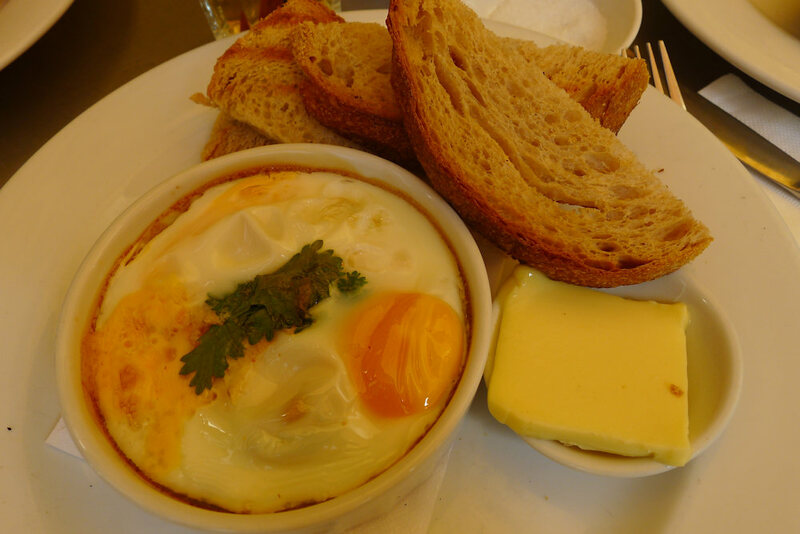 Reading baked eggs with sourdough soliders ($11.50) on the menu made our mouth water. There are 3 different options, we boldly (and wisely) chose the prawn, ginger and coriander. I don’t think we’ve ever had prawns for breakfast but they worked well with the baked eggs and other flavours. The dish was fresh tasting and was presented beautifully. 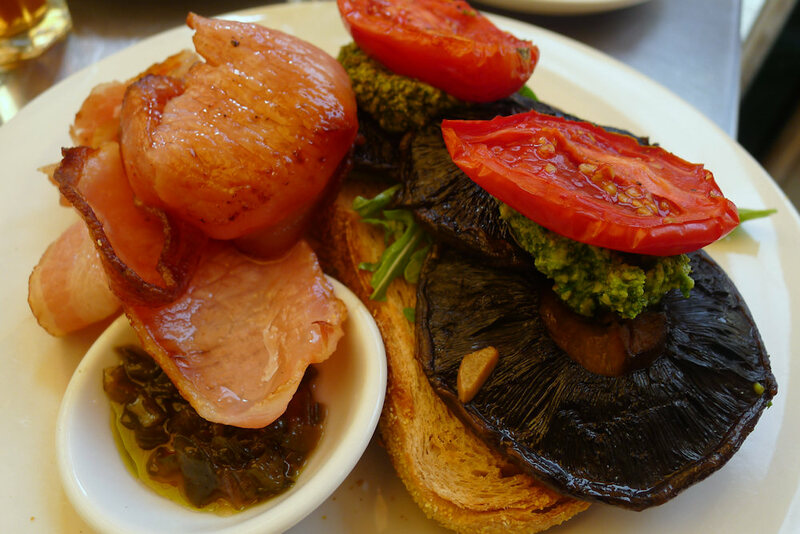 Other options include mushroom, feta & chipotle chilli ($11) and bacon, zucchini &basil ($11.50). The menu boasts the delicious-sounding croissant French toast with spiced berry compote and maple syrup ($11) however one of our guests opted for a plain croissant with jam. 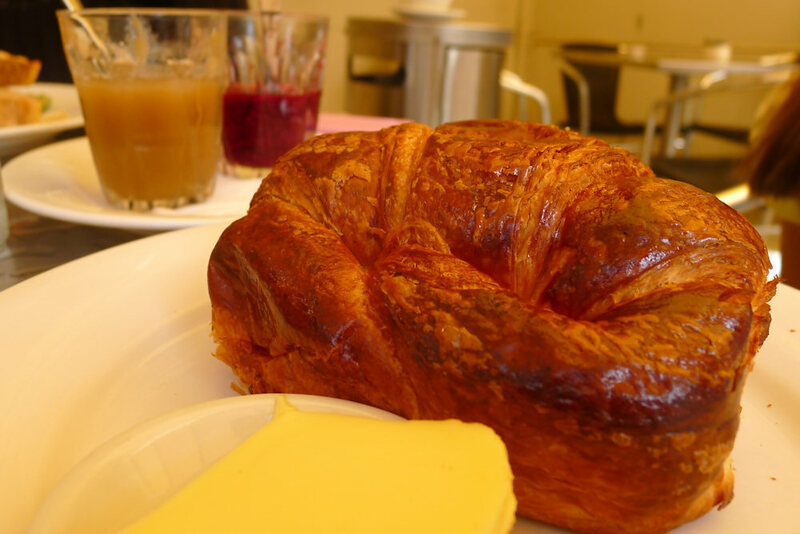 The purists at the table were quite critical of the texture and flavour of the croissant however she was outnumbered by those who thoroughly enjoyed it. The jams included were a berry compote and butter-apple. The compote was outstanding and when we ran out of bread to spread it on, we finished it with the spoon. Mmm… It comes highly recommended and if you’re in the area drop by and try it. 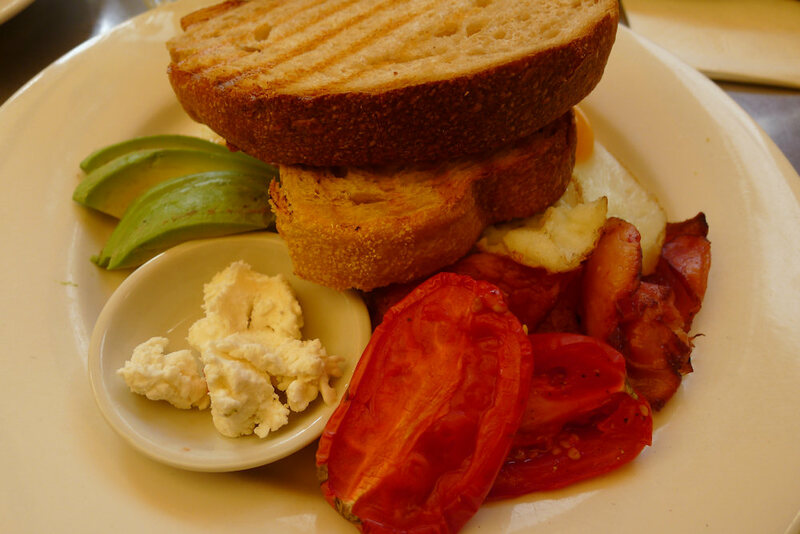 One glance of a fellow patron’s plate was enough to convince us to order the free range eggs on sourdough ($8). Scrambled or poached are the only two options on the menu however we had seen them fried so that is how we requested them. The yolks were bright and the eggs had been cooked slightly more than medium but were still runny and tasted great. We added sides of roasted tomato ($2), avocado ($2.50), goats cheese ($2.50) and bacon ($3) which was a good combination. The goat’s cheese, egg and bacon particularly went well together and there was enough of each of these sides to make a filling and exceptional ‘big breakfast’. Other dishes that we’d like to return and try include coconut hotcakes with banana, cinnamon ricotta & maple syrup ($12.50), Moroccan eggs on roasted kumara ($11.50) and a big selection of open omelettes such as chorizo, spinach, olives & feta ($13), smoked salmon, caper & brie ($13.50) and haloumi, fresh tomato, mushroom & chilli jam ($13). This café came recommended by a friend and it’s not hard to see why. 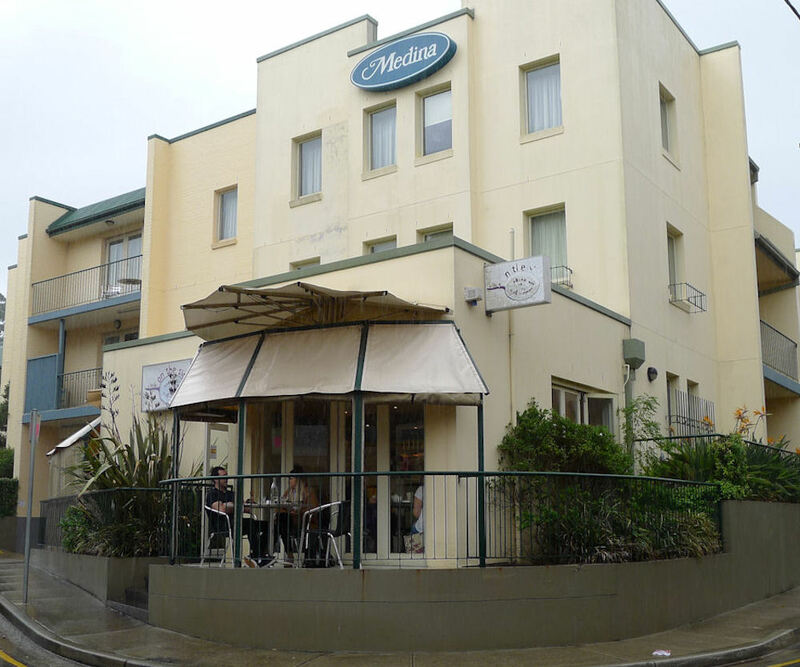 It’s only a short walk from Redfern Station so is easily accessible by public transport. 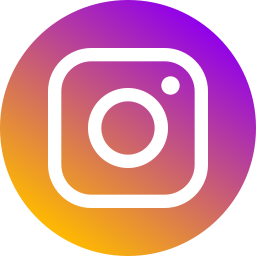 If you’re in the area we recommend checking out the Carrigeworks Farmer’s Markets on a Saturday, drop by the Sports and Aquatic Centre at the University of Sydney, or stroll up to Newtown for some shopping. If you’ve tried any of the items on our wish list above, please be sure to let us know. This entry was posted in Sydney - South and tagged Dog friendly, Organic Options, Outdoor seating, Parking close by. Bookmark the permalink. My friend always orders the coconut hotcakes without fail. And it’s not on your wish list but the I still dream about their polenta pancakes with prosciutto.